Mr. Joseph Mazoff, inventor, member of the Society of Manufacturing Engineers and president of J & A Machinery started his metal crafts career in Pennsylvania as a young apprentice nine years old in a black smith shop in 1926. In 1938 at age 18, competing against more than 300 experienced competitors in their fifties and sixties, Mr. Mazoff took first place in the Pennsylvania state wide tool grinding contest, including twist drill sharpening. Mr. Mazoff has lectured on Drill Point Geometry in various universities such as Brigham Young and other teaching institutions in nationwide states such as Texas, Kentucky, Pennsylvania, Ohio, New Mexico and other states. Also, Mr. Mazoff authored an 11 page article titled "Choose the Best Drill Point Geometry" which was printed in the June 1989 issue of "Modern Machine Shop" magazine. (Reprints of article available by contacting "Modern Machine Shop" magazine). Back in the Appalachian Mountains where the author started his career in a blacksmith shop, electricity was unknown. Consequently, when drilling holes manually with 1 1/2" diameter drills, such drilling was painstakingly slow, requiring much time, patience and physical effort. Therefore, through experimentation; it was established that once a conical (conventional) surfaced drill was ground with a flat surface (multi-faceted point); it produced a linear chisel which required 150 percent less thrust than a conventional drill. However, as manual proficiency to grind multi-faceted points declined down through the years, such points declined accordingly because they are extremely difficult to grind by hand. However, due to the recent advent of NC machinery that demands self- centering points, multi-faceting has been revived to meet the demand. As you will note in the pages that follow, a most important feature of multi-faceting is the wide variety of drill points it permits to better serve the craftsmen's needs; especially in this modern age of exotic metals. Exotic metals are indispensable, compelling our craftsmen to adapt to more up to date Drill Point Geometry. Hence, the purpose of this article is to inform and update craftsmen on this superior type of drill point geometry with V its greater variety of geometrical patterns for more advantageous applications. Other aspects of drill point geometry will be covered that are rarely or ever covered in print since practically all drill point data deals with the same meaningless information telling craftsmen that "It's important to Keep Drills Sharp." Instead, this article elaborates on how to sharpen drills for best results and to clarify long standing unproductive misconceptions. The drill is the most important, least understood, and most neglected of all cutting tools, and, we accept drill point standards, based on inflexible precedent A rather than logical deduction and experimentation. As an example, craftsmen assume that the 118° point is a good compromise or general purpose point for drilling a variety of different metals and this erroneous information appears in machine shop textbooks. Varying the point angle has nothing to do with cutting action. The 118° point is pure myth. In reality, a compromise between high and low lip clearance angles is the determining factor for a general purpose cutting tool, NOT the (non-cutting) point angles. On the other hand, when lip clearance angles are compromised, we are bucking the "laws of physics". Meaning that if we compromise the cutting edge of an ax, it will do a poor job to either shave a beard or split a log. Thus, lip clearance angles must be adjusted to the metal's degree of hardness and machinability. GENERALLY, less clearance for hard metals and increased clearance for softer metals accordingly. As to drill point angles, note in fig. A, that the full length of the cutting lips are involved in cutting action while in fig. B, only 64 percent of the lips length are involved in the same depth of parent metal. Maximum rate of penetration into metal occurs only when the full length of the cutting lips are involved in the material. Thus, the more blunt the point, the sooner the lips are involved in full cutting action. Although figures A and B have the same width denoting the same drill diameter, the more blunt point of fig. A has shorter over all cutting lip lengths than fig. B's. This means that fig. B would drill the same size hole but with longer lip lengths and a wider ribbon, thus creating more torque for the same size drill. Specifically, the lip length of a 1 " diameter drill with 140° included angles will measure 9/16" per lip and the same drill with 118° included angles will measure 39/64" length per lip. Multiplied by both cutting edges, the 1" drill with 118° included angles is the equivalent of drilling with a 3/32" larger diameter drill. With larger drills, the spread is markedly increased. Note in Fig. D that the chisel's profile is flat (linear) running straight across the drill, forming sharp acute angled corners where the chisel ends join with the web surface. When drilling a hole, the chisel's full length contacts metal and the chisel's corners simultaneously augurs into the metal, immediately producing chips. Furthermore, the flat ground facets produce a pronounced sharp edge on the chisel as seen in Fig. C. As a result, the chisel has outstanding extruding properties permitting less thrust, less heat, and greater productivity than the conventional drill. The conventional drill has a bow shaped (non-linear) chisel which literally wears a saucer shaped depression in the metal for the full depth of the hole. In stainless steel, frictional heat is sufficient to turn such a drill blue, generating temperatures over 1000°. With rounded surfaces on each side of the conventional drill, it has poor extruding properties, calling for high thrust pressure. In drilling operations, the by-products of rotational energy is chips and heat; either high heat and less chips or less heat and more chips. Multi-faceted geometry generates the least amount of heat of all the drill point patterns. In comparing two drills of the same diameter, the multi-faceted drill features 150% less thrust and 70% less heat than a conventional drill. Four faceted drill points consist of separate cutting lip (primary) and secondary heel clearance (relief) facets (fig. E) and extending the secondary facets to G the midway point of the chisel produces the apex (point) (fig. F) at the center of the chisel's long axis. As a result, it produces a self-centering point, eliminating center punching and pilot holes. It won't walk, and is the most accurate of all points. It's especially applicable to NC machines, matched holes on dies and can be ground on the largest of drills. Primary facet angles is determined by the nature of the material being drilled while secondary facet angles are at 20°. The conventional split point (CSP) is highly productive but is limited since it cannot be utilized on drills beyond 1/2" dia. In addition, the neutral corners of the CSP impedes the escape of the chips resulting in a weld bead that has a tendency to neutralize the advantages of the CSP. Furthermore, the CSP is a most exacting and critical geometry to re-grind at the local shop level. However, the Modified Split Point (MSP) (figs. I and J) doesn't have the shortcomings of the CSP since re-grinding the MSP is not a critical operation. Furthermore, the MSP is a far more productive point. In fig. J, note that the webb's notch has a positive rake, resulting in secondary positive cutting edges up to the chisel, thereby increasing drilling efficiency. Also note that the secondary cutting edges blends into the primary cutting edges with less acute angled corners, thereby permitting the MSP to be ground on drills up to 3" in diameter. The chisel length (fig. 1) can be reduced accordingly to a length of 0.050" for 3" diameter drills down to 0.010" for 1/4" drills, resulting in unparalleled extruding properties; permitting the cutting edges to bite deeper in to the metal for thicker chips. The MSP produces a self centering drill which eliminates pilot holes even for 3" diameter drills. Notches are ground parallel to the flute angles (fig. J) which permits self cleansing notches, allowing chips to flow freely up the flute. With the notch on the opposite webb angling diagonally up and away from the other notch, the webb thickness is not compromised, thereby permitting a stronger point that allows increased thrust to drill holes more rapidly. As a result of these features, the MSP developed by the author is superior to the MSP produced by Renault-Peugeot or other sources. Using the Swedish IMA drill press with controlled feed and speed settings, our company confirmed that the Modified Split Point produces 3 to 5 hundred percent more holes than the Conventional Split Point and 7 to 8 hundred percent more holes than new factory ground conventional drills. Written testimonials from other reputable sources confirms J&A Machinery's findings. 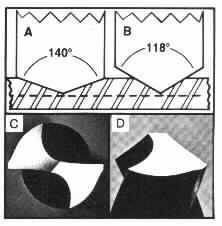 Modified Split Points also generate the least amount of heat of all twist drills, An article entitled "Pointing Towards High Drilling Rates" published in the June 1982 issue of Modern Machine Shop magazine, page 85, showed a thrust chart with the following information. At a feed rate of 0.027 IPR and four different drill points being the same diameter of 1.57 inches, the conventional drill required the most thrust, over 5,000 pounds while the MSP Renault-Peugeot point (R.P.) required the least amount of thrust, 2,000 pounds to drill the same size hole. However, the MSP developed by Mr. Mazoff of J & A MACHINERY CO. requires 165% less thrust than the RP point to drill the same size hole. In sharpening the MSP, chisel lengths are varied, ranging from 0.050" on a 3" diameter drill down to .010" on a 1/4 " diameter drill. The rake across the webb (the notch) can be varied, ranging from 5° positive for the softer materials to a 5° negative for the hardest materials. The MSP is especially outstanding for stainless, inconel, titanium and other difficult metals. The MSP is also self-centering, eliminating pilot holes. The Dubbed drill (fig. K) can be used for drilling many materials in addition to brass and copper. Conventional twist drills have maximum positive rake (angle or pitch) of the flutes at the outer extremes of the cutting edges and gradually approaches a neutral or slightly negative angle at the webb center, depending on the drill's helical nature. This results in cutting edges with variation in cutting action, reduced to it's minimum in the vicinity of the drill's center and excessive at the outside lip corners where there is the greatest degree of rake and rotary travel. This situation puts the cutting edges in the OD area under tremendous stress and is a primary reason for lip corner breakdown. However, dubbing the flute surfaces produces uniform rake angle across the full length of the cutting edges (fig. K), thereby increasing cutting action in the central area of the drill where it is normally minimal and gradually decreased toward the OD where it is normally excessive. This results in more equalized distribution of cutting action across the lips full length, thereby reducing corner breakdown while markedly increasing drilling efficiency. In fig. L, note the dubbed cutting edges have reduced the chisel's length. Therefore, a dubbed drill is also self centering, eliminates webb thinning, center punching and pilot holes. The notches on this drill also angle away from each other like the MSP to preserve the thickness of the webb's central surface for greater strength against crushing forces. Fig. M and N are cross sections of dubbed rake angles, but note that the lip relief angles remain unchanged in both figures. However, the cutting edge in fig. N is producing the thicker chip because of an increased rake of the dubbed flute surface. Such geometry produces a planing action due to low lip relief angle which reduces hogging-in and drill chatter, thereby increasing productivity and accuracy. A reduced chisel as in fig. L and increasing or decreasing the rake accordingly permits a dubbed point to drill hard or soft metals, bakelite, fiberglass, plexiglass, copper or brass. When drilling very soft copper or brass, use 5 ° negative rake and as metal hardness increases, adjust the rake accordingly towards a positive rake angle. Drills with unequal lands are quite common and they are simply IMPOSSIBLE to grind properly since the cutting lips are not at opposite positions of 180° from each other. Needless to say, such drills, even new ones will NOT drill efficiently or accurately. Equally deplorable and common are drills with unequal flute to flute surface configurations. However, dubbing such drills will dress out the differences, therefore leaving dubbed lips at a precise opposite 180° position from each other and uniform configuration of flute to flute surfaces. An additional problem are the numerous flute surfaces that have rough serrated surfaces that results in saw toothed cutting edges that break down more readily. Dubbing also solves this problem, producing smooth uniform surfaces on such drills, thereby increasing lip life. For stainless steel, drills are ground with 140° included drill point angles and 10 to 12° lip relief angle facets which assure more positive cutting action while the blunt 140° point assures maximum lip involvement in the earliest possible time. The key to drilling stainless steel is to avoid work hardening by obtaining maximum cutting action in minimum time. The recommended point is Fig. I in page 2 and secondary point angles (Fig. H, ) to strengthen the lip corners. The secondary cutting lips constitute 10 to 15 percent of the lips overall length. The notch (Fig. J ) may vary from 5° positive notch for soft stainless, neutral for semi-hard and 5° negative for hard exotic metals. Plastics are notorious to drill; demanding the highest degree of drill point accuracy; and especially the most blunt of all points. 1/8" thick plexiglass was drilled at 35°Fahrenheit above zero with different variety of drill diameters and point angles. Beginning with 80° included angle drill points, the material would shatter every time as the drill point began to emerge through the bottom surface of the material. As the point angle was increased (more blunt), destruction of the plexiglass was reduced accordingly. At 134°, breakage was markedly reduced. At 142°, there was no breakage. Chipping around the bottom shoulders of the hole as the drill exits was eliminated with secondary point angles (Fig. I, ). In this case, the secondary cutting lips were 20 percent of the overall lip length. Therefore, it was concluded that the recommended 60 to 80 included angle points were the most destructive in drilling plexiglass. With such a spear shaped point, when the drill begins to emerge from the materials, a small irregular circular shaped hole with feathered edges develops in the bottom surface. Consequently, the spear-shaped cutting lips wedge into the feathered edges at right angles, causing a binding and locking action that instantaneously shatters the material. On the other hand, a blunt point with less wedging action exits more gradually with its cutting lips more parallel to the feathered edges. In essence, the recommended 60 to 80° point standards for drilling plastics have no scientific merit. In the final analysis, the most effective point consisted of 144° included angles for the primary point, 80 to 85° included secondary point angles, 4 to 5° primary lip clearance angle facets and 20° secondary heel clearance facets. (Twenty degree heel clearance facets are automatically ground whenever primary angle facets are 8° or less). The general rule is that as the primary facet angles are reduced, the secondaries are increased accordingly as in figure P. Thus, blunt drill points with lip clearances adjusted for specific materials have equal application on hard and soft ferrous, non-ferrous, and some non-metallic materials. Excessive lip clearance is extensively practiced throughout the U.S. In fragile material, it causes severe hogging in and material destruction. Also, it produces over-sized holes and is a primary cause for reduced cutting edge life. Such excessive clearance is due to the tendency to incorrectly view the drill as shown in Fig. D. In viewing that drill, most readers would insist that the drill has little or no lip clearance. However, it's an optical illusion since that drill actually has a high clearance of 15°. Never the less, practically all craftsmen try to determine lip clearance by looking directly into the drill as in Fig. D. In doing so, one is looking into a compound angle, looking at the overall surface of the drill rather than a side PROFILE of the cutting edge itself. HOW TO VIEW LIP CLEARANCE ANGLE. An eyeball method that's fast and positive is to read the chisel line angle (chisel's length). If the chisel's line angle is on a vertical plane pointing to 12 o'clock (90°, in relation to the cutting edges on a horizontal plane, lip clearance would be zero. But as lip clearance is gradually increased, the chisel line inclines diagonally to the right accordingly towards 1 o'clock, (fig. 0). Therefore, by paralleling the cutting edge with a protractor, a reading of 110° of the chisel line angle denotes approximately 5° or low clearance; 120° indicates 8° or medium clearance, 130° indicates 11° or high clearance, and 135° indicates extra high clearance. With some practice, a glance will instantly reveal the clearance status quite accurately without a protractor. HOW MUCH CLEARANCE DO WE NEED? Using a two faceted drill as fig. 0 for example, slight impingement about 1/32" in size first occurs at the rear out- side heel corners when constant lip clearance is reduced down to 7°. 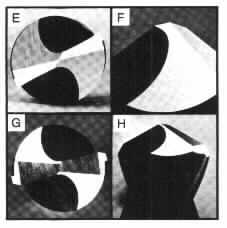 At 5°, impingement is approximately 1/16" in size, and further clearance reductions result in a triangular shaped impingement radiating primarily toward the lips and secondarily towards the chisel. Therefore, a small secondary facet (fig. P) is required only when the constant clearance is 8° (medium clearance range) and the secondary facet size is increased gradually toward the cutting edge (fig. G ), as the primary lip angle is reduced accordingly down to the 5 to 3 degree range (low and extra low clearance range). In selecting the correct lip clearance angles, it requires analyzing the material's machinability, hardness, brittleness, fragility, etc. Since drill chatter and hogging in can be detrimental to both drill and material, it obviously demands reduced clearance in a fragile or hard material. Reduced clearance produces a smoother and more accurate hole while permitting increased drilling speeds to compensate for chip thinness. A FINAL NOTE ON PRODUCTIVITY: In the early fifties, the author was involved in introducing the dental profession to high speed air turbine mandrels that allowed dentists to drill out tooth decay at least 500 percent faster than with the former gear driven mandrels. In short, the metal fabricating industry is behind the times, losing countless millions of dollars due to low speed drilling operations. High speed and flood cooling is the ultimate answer for high productivity. However, drill presses must be in top condition with absolute accuracy. Readers should be forewarned that factory ground drills generally do not meet such accuracy requirements due to mass production; and also applies to various drill sharpeners that lack proper mechanical design and concepts to assure the extremely high degree of accuracy. In drilling operations, J & A Machinery normally utilizes speeds 300 to 400 percent higher than recommended in the handbooks. Handbooks must recommend lower speeds because of inaccurately, manually resharpened drills and run-out on worn drill presses. Spades blades utilize the same geometry of this article and they are fabricated with more blunt points, therefore offering the users the advantageous features as reflected in this article. The spade blade has numerous superior advantages over twist drills; such as permitting a more open channel for the coolant to reach the cutting area in the hole, elimination of woodpeckering in deep holes and excellent chip breaking properties. And since the spade blade holder is a thick walled tubular structure, it possesses superior torque properties, therefore permitting much deeper holes than twist drills. In addition, one holder can accommodate up to eight different sized blades, thereby drastically reducing both cost and storage space to a fraction of eight twist drills. And since holders are produced in different lengths, the operator has more flexibility to meet specific drilling requirements. A primary objection to greater use of spade blades has been the expensive and time consuming resharpening operation, However, J & A Machinery Company's drill grinder rapidly sharpens spade blades. In most American machine shops, drills are in the most deplorable condition of all cutting tools, namely bent drills, with excessively thickened webs, large nicks and chips of the cutting edges, badly worn margins, scored and distorted shanks and cheap quality drills. It should be noted that top quality work demands top quality drills. Top quality drills are all the more important, considering that drilling operations lead all other fabricating steps. Drilling operations exceed milling, bending, stamping, turning and all other operations. It's impossible to calculate monetary loss as a result of unproductive drills in our nation's metal working shops. This monetary loss is compounded due to scrapping costly finished work pieces, nullified by the final step, the drilling operation, further compounded by a general lack of knowledge on drill point geometry; thereby failing to take advantage of the best geometrical patterns. The drill is simple in appearance but complex in function. J & A Machinery manufactures the "CHAMP" Multi-Faceting machine that grinds all the points listed in this article and though it's unequaled in price and drill capacity, readers are urged to compare the CHAMP against all other multi-faceting machines to satisfy themselves. Be sure to compare the price, capacity, and ask competitors if they can grind the positive notched Modified Split Point.